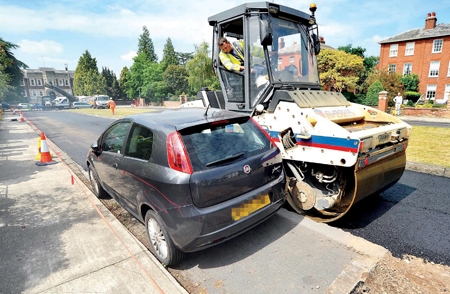 This is the moment council workmen resurfaced a road and laid tarmac – around a PARKED CAR. Stunned residents watched as workmen dug up the 300ft (91m) road but left a neat rectangular island around an abandoned grey Fiat. 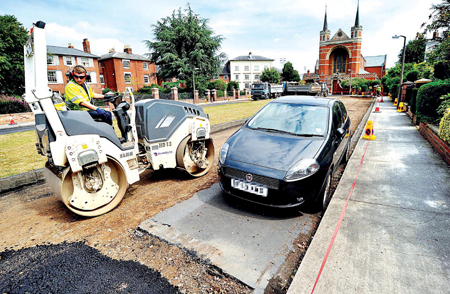 Workmen decided to resurface the road after failing to locate the owner of the car, which was left on St George’s Square in Worcester. One resident said: ”It’s utter madness. I couldn’t believe the workmen started resurfacing the road around the car. ”When the car is finally moved the road will look ridiculous. Worcestershire County Council warned residents last Thursday about a two-day operation to re-lay the road which was last done 25 years ago. But when workmen showed up for work on Tuesday they discovered the parked Fiat Punto at the side of the road. Instead of trying to track down the driver, workmen started digging up the road and rolling it flat except for a 10ft by 6ft rectangle around the car. Residents on St George’s Square say the new car was left outside a house two-and-a-half weeks ago and is not owned by a local resident. Alastair Graham, 65, a retired chartered surveyor, who has lived on the square for 24 years with wife Patricia, said: ”We get plenty of people parking up here because it is 10 minutes walk to the station let alone to the city centre. 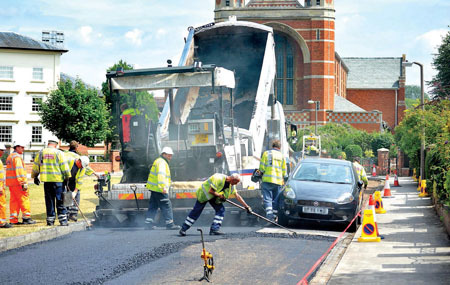 Worcestershire County Council defended their decision to work around the car and said workmen will simply fill in the gap at a later date. A spokesman said: ”Powers exist to deal with vehicles causing an obstruction but it’s very rare we have to use them. West Mercia Police confirmed they are sending a Police Community Support Officer (PCSO) to the registered keeper’s address after failing to get their phone number. Inspector Janet Heritage said: ”As the registered keeper is local, I have asked one of my CSO’s to go around to the address and ask that they move the vehicle.